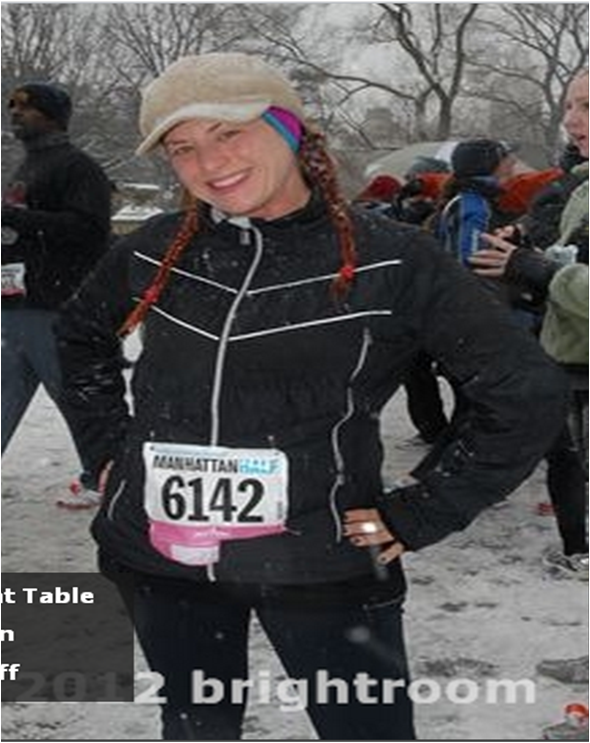 Last Saturday (Jan 21) I ran the NYRR Manhattan Half Marathon in the heart of a beautiful cold, slushy, icy snowstorm. From a week out I was watching the weather reports and “Wintry Mix” kept appearing in the forecast. I knew I had a choice to make. I could either moan and groan and worry about all the discomfort and troubles that snow might cause or I could just accept it and make the absolute best of the situation. I decided to accept it. To that point, I decided to fully take it on, embrace it as a wild adventure and truly enjoy the challenge of running in a snowstorm for 13.1 miles for the very first time. Every time I looked at the weather forecast I automatically reacted with an enthusiastic ‘Yes, Snow! Bring it!’ and decided no matter what the scenario, I was going to finish this half marathon. Nothing was going to hold me back unless the NYRR organizers decided to cancel the run. A few days before the Manhattan Half Marathon I started reading “The Secret” by Rhonda Byrne. (I’m a voracious reader because I spend a lot of time commuting for work.) I was deeply affected by the notion of the Law of Attraction and the tremendous power we have within our thoughts to project us onto various frequencies. “Your thoughts are the primary cause of everything…You are the one who calls the law of attraction into action, and you do it through your thoughts. You will attract everything that you require. Basically, the universe hears our thoughts and will attract to us what we think. The key: Be Positive. I’ve always been a generally positive person so a lot of what The Secret discusses naturally resonated with me. In preparation of this race and throughout the actual run, I thought a lot about what The Secret teaches about how to think positive. Thinking in negative terms will not be heard by the universe. For example, as a runner if you think – “I won’t fall on the snow. I won’t get hurt.” – the universe doesn’t hear the negatives, only the positives. Your thoughts will be interpreted as “I fall on the snow. I get hurt.” and thus attracting those events to you. The night before the race there was a lot of chatter on the NYRR Facebook page about whether the race will be cancelled. Would anyone run in the snow? And plenty of negative talk about hating to run in the snow. 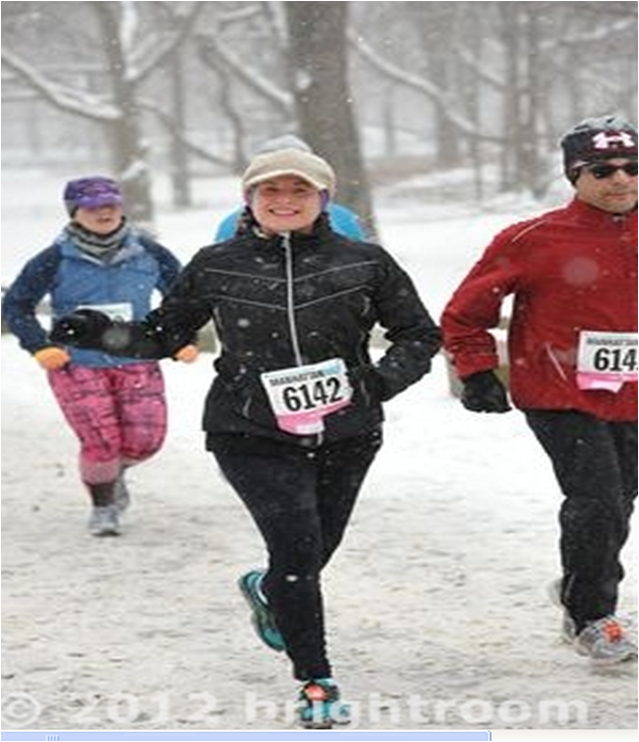 I put up my mental shield, closed my eyes and went to bed visualizing myself running through the snow, around the loops of Central Park, gliding up and down the rolling hills and finally crossing the finish line. I even visualized sipping slushy water and Gatorade at fluid stations. I ran the race before I even crossed the start line so I knew I could do it. 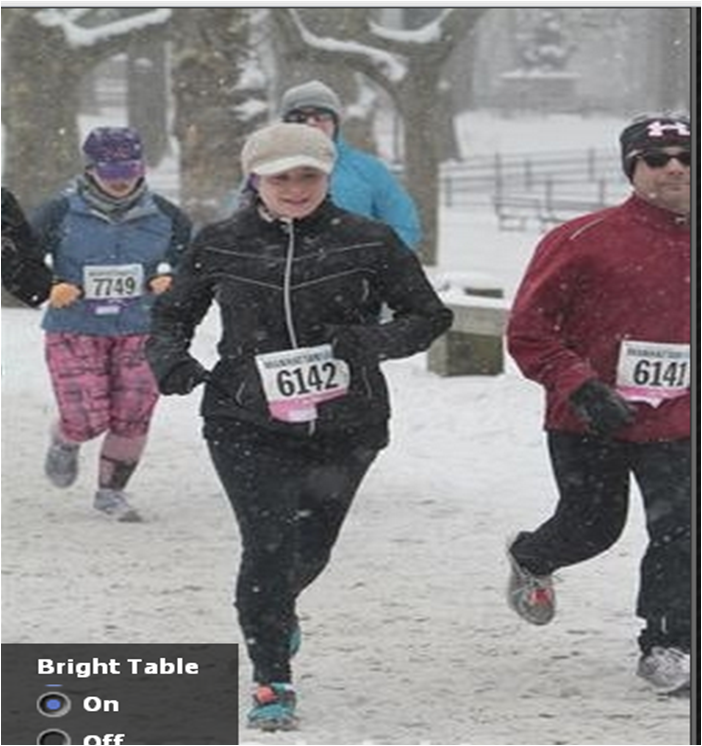 Early in the dark of morning, my husband, who is also a passionate runner and signed up for this race, was concerned about traveling into the city and whether we could run in a snowstorm without getting hurt or freezing cold. I told him I was confident we could do it. We just need to dress warmly (we had all the right gear), take it very slowly and carefully. Make the event fun, not a nuisance. Don’t focus on achieving a specific time. Just finish. As it turns out, the organizers had the same idea and decided to turn the race into a Fun Run with no scores or official times. When we opened the door to our house and walked to the car the dark chill was invigorating. I just kept repeating to myself, “I will finish this run.” The ride into the city was slippery and slow. When we came out of the Battery Tunnel and drove up the Westside Highway there wasn’t a runner, let alone a dog-walker, in sight. My mind wanted to drift into negative-land but I concentrated on countering with positive thoughts. As we drove along Central Park West, getting near 63rd street, I finally saw one runner with a bib prancing over the snow into the park. I felt a little relief. Then as we drove a block more I saw a handful more runners jogging across the snow-covered street. And soon there were at least 20 runners heading into the park for the race. I felt motivated and excited to join them as soon as possible. The party was on! We parked the car and lightly trotted into the park to the baggage check-in area. There were about 2 inches of snow on the ground and the storm was just getting started. In case you were wondering, NO the paths were not plowed. The streets had barely been touched. Who was going to take time to plow and salt the walking paths of Central Park before an 8am race? I quickly get a crash course on how to run on snow. Woah, was it slippery and slow! But I was doing it and so were lots of others around me. No one fell or wiped out or crashed. Everyone was bouncing gently across the packed-down snow that kept on sprinkling on our running gear. Turns out that there were many runners who showed up (i don’t know actual count but at least a thousand based on the snaking trail of racers). It was an awesome feeling to be in that charged environment. Off we start to lots of cheers and shouts of encouragement. We work our way around the bottom loop of Central Park and then up the east side. We had to run 2 counterclockwise loops. It was a lot of work just to take a step that could project your body forward. My entire posture had to be re-adjusted. At first my ankles were a bit wobbly. I had to watch for ice patches and keep to the fresh powdery snow with good traction. My eyes had to adjust to all the whiteness to avoid feeling nauseous. My hat and jacket were getting covered in a nice coating of snow that I had to shake off every so often. My eye-lashes were frozen icicles that I had to keep wiping. My breathing was also impacted because the snowflakes kept being sucked up my nose or into my mouth causing me to choke and get a chill at the same time. Some might find these obstacles a complete turn-off to running; I loved every single moment of being confronted with new challenges. For the first several miles I kept expecting my feet would get wet and chilled. It never happened. Throughout the entire race I was always comfortable and warm. My face was chilled but it felt wonderful. My hands were warm. My body felt strong and light. Most important, my feet were warm and dry! God bless the inventor of the Brooks Pure Cadence sneakers and my WigWam Ironman Socks (yes, socks are equally important as sneakers to a runner.). I was very curious to see how my sneakers held up in snow or rain. They remained perfect the entire run. As we passed mile 3 my husband and I looked at each other in wonder… ah, only mile 3? We had worked extremely hard to push along the course. Every step was a subtle slide back so that it sort of felt like running on a treadmill if you didn’t concentrate on projecting your body forward. So many times I could have let negative thoughts sweep over me. Like when we passed mile 5 and the snow was a good 4″inches and covering most of the mile marker sign. Central Park covered in snow is a magical vision. I lost my bearings often because there was nothing but a milky whiteness surrounding me, covering all the buildings and paths. The park was also very quiet and still except for the gentle movements of the runners. There are many reasons I wanted to do this half-marathon but mainly it was because I wanted to prove to myself I could do something I’ve never done before as long as I set my mind to it. Amazing challenges have come my way throughout my life and I have conquered them, worked through them, feeling stronger and better for it. But the challenge of running a marathon I have yet to accomplish. This half marathon was one goal I set to keep me on track towards achieving a marathon. One fear that had been nagging at me for months was the weather on the day of the NYC Marathon. What if it rains? What if it’s freezing cold? What if it snows? All of which are possible in early Nov for NYC. How can I prepare? The Manhattan Half Marathon was my test. Now I know that the weather will only help me to finish the marathon, not hinder me. I do not have a real-time goal… 4:30 hours would be very nice though. It’s going to be my first one so I will just focus on finishing. Weather will not stand in my way and I’m learning how to keep my mind from getting in my way. If you put your mind to it, you can do it. All these phrases can sound cliche` if you never actually tried putting them to good use. But I did use them to push me across the finish line of this race. The power of positive thinking is where true strength can be found! We finished the race in 2:30 minutes which is a few minutes slower than our average half marathon finish time. Our average pace hovered around the 11 min per mile range. With double the energy it required to take each step this race was as much a strength training experience as it was cardio. As I approached the last mile I felt sad to see it all come to an end. Once again, I wanted more and felt strong enough to keep going if I had to. Give me a blizzard and I was ready to run straight through it! I think that’s a great way to end a race when your longterm goal is to run a marathon. Congratulations! Recently I think I finally got the words from this quote “Wheresoever you go, go with all your heart” from Confucius. It’s not my default mindset though. I have to intentionally move and remain there as long as I can, and then go back, and back again. You’re there! Good job!